Getting a new set of show pigs into your barn and on feed is a lot like running a daycare. Those young pigs are coming from various homes or points of origin with various germs and sniffles. They are also 100-percent dependent on their human caretakers to make sure they have everything they need to get started on the right foot – a warm, dry environment, fresh clean water and plenty of feed. 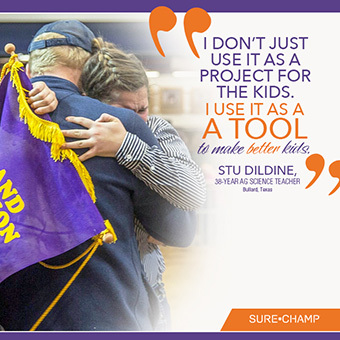 Dildine has helped students start and feed thousands of show pigs during his 38-year career as an educator. He said once the new pigs get to your barn, make sure they receive an antibiotic, have a warm, dry pen, and plenty of fresh water. He recommends keeping all pigs separate to keep them from fighting, causing unneeded stress and injury. His one exception is if he has purchased a group of young pigs that have been penned together. Even then, he said he likes to separate them as soon as he can. Water is the most essential nutrient for all livestock. Although different systems are available, from a gravity flow to a pressure system, Dildine said the most important thing to remember is to keep it fresh, clean and available at all times. In the winter, make sure your pipes don’t freeze, and if the water system relies on electricity, make sure that power source is always working. Various feed companies exist, and each exhibitor or feeder will likely find his or her feed of choice based on experience, recommendation, convenience or price. Dildine said when he first brings young show pig prospects home, he starts them on a starter feed that contains anywhere from 16-20% protein. For the first month, he will keep this starter ration in a self-feeder at a minimal level, so the pigs have some feed in front of them all day long. He does like to clean the feeders out at the evening feeding and monitors to make sure that each pig is eating during the day. Once the pigs have been in your barn for 30 days, and have adjusted to the starter feed, it is important to evaluate their growth, structure, and muscle development to determine the next steps to your feeding program, according to Dildine. “Study structure of your pigs, especially feet and legs. That will tell a lot in the first 30 days of feeding,” Dildine said. If a feeder studies the muscle shape and base width of the pigs’ feet and legs, that will help determine the amount of protein to push to the pigs. A base-narrow pig that needs to build more muscle will typically need increased amounts of protein, whereas a pig that is already heavily muscled and stands wide-based early on might need a reduced level of protein. For either case, be sure to watch your pigs closely as they do change very fast. Of course, the first few days, weeks or months of feeding your project might not always go as planned. It is likely that your pig will go off feed at some point in its lifetime. Be sure to have products on hand to help increase gut health, as digestive issues are often the culprit. 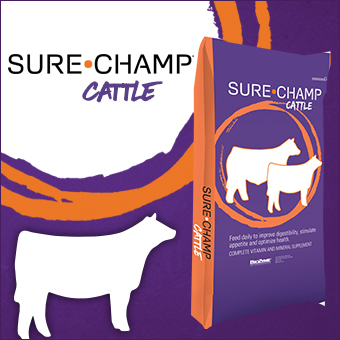 These products can range from yogurt and buttermilk to items made specifically for livestock like the Sure Champ® or Vita Charge® products that contain the Amaferm® advantage. Amaferm is a precision prebiotic designed to enhance digestibility by amplifying the nutrient supply within for maximum performance. 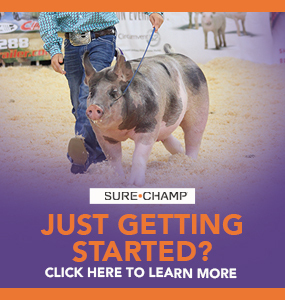 Sure Champ Spark® is a pelleted top dress supplement that was designed to help increase appetite and improve digestive health. Vita Charge Liquid Boost® is a liquid supplement that supports digestive health and promotes feed and water intake during times of stress and recovery. It can be administered through a medicator, mixed with water, used as a drench or top-dressed on feed. Vita Charge Paste is a quick-response product that helps provide a jump start to the digestive system to protect livestock during stress. All three of these products contain Amaferm, which is research proven to increase water and feed intake, and MOS, designed to trap bad bacteria, limiting their ability to do harm to digestive health and intake. These products are also formulated to support the animal’s immune system and replenish any good bacteria that antibiotic treatments would wipe out. Dildine says the most important thing to getting your pigs started eating and gaining correctly, is to never be afraid to ask a question, and be sure to buy from people who will be there to assist you. “There is no dumb question in this business. Young people and parents have to ask to learn to get things right. Especially, the first and second-year exhibitors, they don’t all have to win, but they need to have a good experience with that animal. I always recommend buying from a program that isn’t just selling a pig, but will also sell a service, “Dildine said.